1. 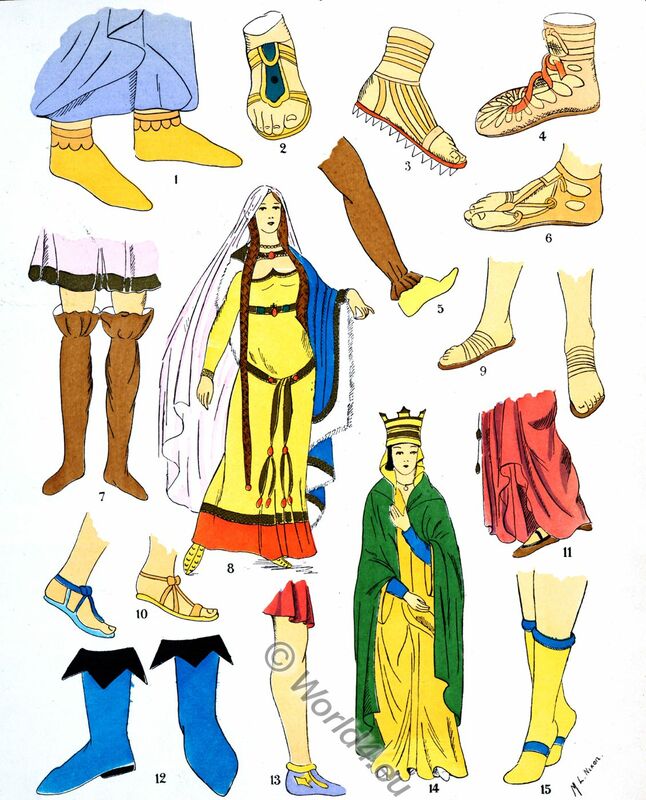 Footwear of King Dagobert (622-638) also worn by women. Shoe to the ankle with revers in rounded teeth. 2. Sandal leaving the end of the foot bare, with flap falling over the instep. 3. Military footwear, also used by peasants and mountaineers. The sole is made of cramp-iron. Bands are wound round the ankle and instep. The heel and toes are bare . 4. Half length boot with complicated lacing adorning the front. 5. Sandal with band passing inside the big toe and finishing on the upper part of the sandal. 8. Dress of a Gallic lady in the time of the sons of Clovis. 9. Footwear of a Gallic warrior, several bands on the front of the foot hold the sandal on. Style often imitated by women. 10 a. Sandal held on the foot by a band passing over the toes, crossing and passing round the ankle, finishing in a knot. 10 b. Same sandal with a more simple band. 11. Sandal worn by Gallic lady in the time of Clovis. 12. Footwear half-calf high with pointed revers. 13. Sandal, with open worked side. 14. Fredegonda, wife of Chilperic, (after Montfaucon). Robe with a full pelisse, footwear for outdoor wear. 15. Footwear according to an ancient bronze. Footwear half calf high with deep revers and band passing over the instep. Clotilde, Queen of the Franks. Merovingian 5th-6th century. The Frankish dominions in Merovingian times. This entry was posted in 5th Century, 6th Century, Ancient, Celts, France, Gauls and tagged Historical Gaul costumes, Merovingian fashion and history, Paul Louis de Giafferri on 3/18/18 by world4.